Use Specification and Description Language (SDL) shapes, designed to International Telecommunications Union standards, to create object-oriented flowcharts that document communications and telecommunications systems networks. In the Flowchart template/category, click SDL Diagram and then click Create. Hold the pointer over the shape until AutoConnect arrows appear around the shape. Hold the pointer over the arrow in the direction you want to add a shape. A mini toolbar appears that contains the first four Quick Shapes that are currently in the Quick Shapes stencil. 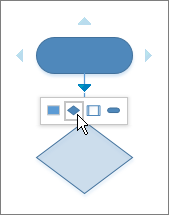 When you point at a shape on the toolbar, Visio displays a preview of that shape on the page. What is Quick Shapes?. Click the shape you want to add. The shapes are now connected. To add text to a shape, select it, and then type. When you are finished typing, click outside the text block. You can number the shapes in your flowchart to illustrate the sequence of process steps. In a flowchart, select the shapes you want to number. On the View tab, click Add-Ons > Visio Extras > Number Shapes. Tip: To automatically number new flowchart shapes as they are dragged onto the page, in the Number Shapes dialog box, click Continue numbering shapes as dropped on page.